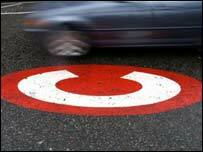 A Devon pensioner is facing a charge for entering London's congestion zone - even though he says he was 200 miles away. Former local government officer Peter Blanchford, 67, from Exeter, was told his number plate, 1HFJ, was caught on a zone surveillance camera in Marylebone Road at 0730 GMT on 4 March. Mr Blanchford, who said the last time he drove in London was 30 years ago, has made written representations to Transport for London, which operates the scheme. Motorists failing to pay the £5 a day congestion zone charge are sent a penalty charge notice of £80, of which £40 has to be paid within 14 days. It rises to £120 if not paid within 28 days. The pensioner said he was "hopping mad" to receive the notice. He said: "I most certainly have no intention of paying the charge, I would rather go to prison." He said the number plates, which came from an MG sports car he owned in the 1960s, were now on his Citroen Saxo. A spokesman for Transport for London said that the surveillance cameras in the congestion zone recorded both the number plate and the vehicle it was attached to. He said the evidence would be reviewed and if they had got it wrong they would apologise.